ART WARRIOR GUIDE... primarily dedicated to the exposure, cultivation, and inclusion into the art world by demystifying the concepts that permeate art collecting. JOIN US FOR SOME FUN ! 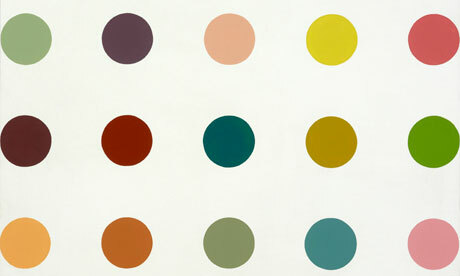 The Complete Spot Paintings 1986–2011 by Damien Hirst opens Thursday, January 12th. Most of the paintings are being lent by private individuals and public institutions, more than 150 different lenders from twenty countries. Conceived as a single exhibition in multiple locations, chronicaling the whole of Hirst's creative range "from the first spot on board that Hirst created in 1986; to the smallest spot painting comprising half a spot measuring 1-1/2 inch (1996) to a monumental work comprising only four spots, each 60 inches in diameter; and up to the most recent spot painting completed in 2011 containing 24,781 spots that are each 1 millimeter in diameter, with no single color ever repeated." Damien Hirst has a reputation as the British Artist that outdid Andy Warhol as a businessman and Jeff Koons as a master of kitsch and I agree. Hirst is offering a free personalized spot print to the first person who is willing to travel to every Gogasian Gallery around the world and sees everyone of the 11 exhibitions. 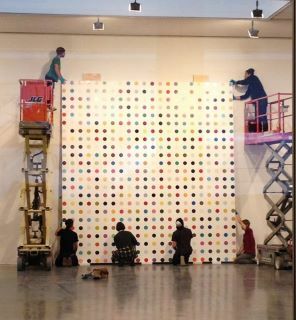 Another reason is that Hirst actually only painted 5 of the estimated 1,400 spot paintings since 1986. I must admit that each painting is equally cheery, modern looking and graphically optomistic and psychologically, yes, it triggers the penny-candy on paper strips that one could buy for a treat in our childhood memories. Three of the 11 venues for this exhibition will be at the Gagosian Galleries, 980 Madison Avenue, 555 West 24th Street and 522 W 21st Street in Chelsea opening on January 12th and closes on February 18th in New York. The film is shown in the gallery in real time that corresponds to real time on one's own watch when you enter and when you leave. Art Enthusiasts seem to think that it is a cool way to spend those quiet off beat hours before daybreak from Midnight on Fridays thought 5AM Saturdays when the gallery is open to the public. In Chelsea is an exciting exhibition featuring painted facsimiles of large playing cards, oil on aluminum, that have been collected by the artist Keith Tyson and spans a history of 200 years. Keith Tyson @ Pace Gallery from The New York Observer on Vimeo. It was fascinating to see the large hand made reproductions of actual playing cards used, and seldom noticed by the card players, who are usually concerned with the card game that is taking place. At the Pace Gallery, they are offering a deck of reproductions of these art cards in the exhibition for the low cost of $15 for a souvenir. I doubt if they will have any other value in the art world.. .but who knows? Neither a painter nor sculptor, but an inclusive artist who uses materials and processes associated with both. An artist whose work has ranged from temporary site-specific installations to large expansive pieces that are permanently attached to a wall. Instead, she is an artist whose work slips in and out of every category, making such distinctions irrelevant. It is a joy to discover the range of materials and cohesiveness of this work while perusing this small retrospective. Judy Pfaff's 'Five Decades' closes October 16. The Ameringer-McEnery-Yohe Gallery is located at 525 West 22nd Street, near 10th Avenue. 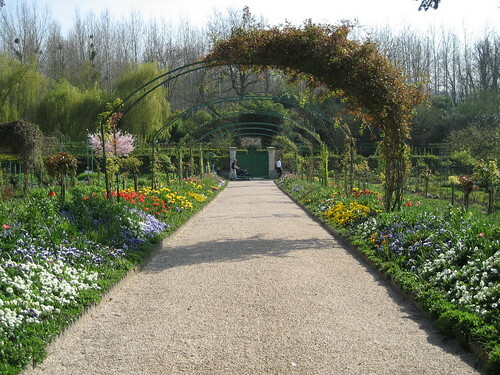 This is the garden (not in full bloom) that Claude Monet painted over and over again as his muse. The exhibition of late work has no resemblance to this photograph as he was unfortunately losing his eyesight. FOR THOSE OF YOU WHO MISSED LAST WEEK here are some of the highlights in Chelsea nicely documented in a video by Jerry Saltz, Senior Art Critic at New York Magazine. We were in the audience while he was filming and took advantage of the Q & A that ensued, which was cut out when this video was edited . I'm not going to list the exhibitions we visited soooooooo...check out the video to know where we were! It's always so much fun to run into Jerry in Chelsea and get his take on the exhibitions as well! He pumped the crowd at Gogo's on Murkami's process of making this large painting displayed in the side gallery and then the discussion got really lively! Check back for highlights from the next gallery walk with the "additional back stories"... Oh Yeah! We begin again on Saturday, September 12th... the Art Gallery Walks begin at 2PM. Tomorrow evening is the Preview of the Fall 09 Art Season with gazillions of Art Opening Receptions all over the city. I will be in CHELSEA promptly at 5PM. I have my list of invitations and I will do a quick look see run through while I also visualize planning the first art walk for Saturday. JOIN US...it will be a blast! meetings of the village committee. Stunning crop art has sprung up across rice fields in Japan. However this is no alien creation - the designs have been cleverly planted. Farmers creating the huge displays use no ink or dye. Instead different colours of rice plants have been precisely and strategicaly arranged and grown in the paddy fields. A Sengoku warrior on horseback has been created from hundreds of thousands of rice plants, the colours created by using different varieties, in Inakadate in Japan The largest and finest work is grown in the Aomori village of Inakadate, 600 miles north of Toyko, where the tradition began in 1993. The village has now earned a reputation for its agricultural artistry and this year the enormous pictures of Napoleon and a Sengoku-period warrior, both on horseback, are visible in a pair of fields adjacent to the town hall. More than 150,000 vistors come to Inakadate, where just 8,700 people live, every summer to see the extraordinary murals. simple design of Mount Iwaki every year. However, their ideas grew more complicated and attracted more attention. Escape the frustration of the heat! Get yourself down to SoHo to view the new ART WALL MURAL...so cool! I was reacquainted with MEYER at the exhibition having been to her studio many years ago when she was an emerging artist. It was great speaking to her about how she makes her paintings. I knew that the paintings are worked flat on the floor, and MEYER moves around the canvas with her brushes and colors and does what she called a "little dance" working spontaneously from the inside out creating strokes with the motion of her body. I have always admired her spectacular use of color and her style of lyrical abstract painting. Her work is now in many private, corporate and museum collections. Our Art Gallery Walk on March 21st was full of surprises... Not only did we have a multitude of wonderful new artwork to view, we also were fortunate to have 2 Artists' Talks... Anne Neely at the Lohin Geduld Gallery. At that time we were very fortunate because the video below was taken by one of our group members, who is also the blogger ART RAVELS. I truly enjoyed viewing this exhibition. The artist is very definite with every stoke of the application of paint. Her marks are deliberate and come together to make exceptional pixilated landscapes. Her use of color is dynamic as well as meditative. FEATURED ON NBC-TVs "NON STOP NY"
I LOVE SATURDAYS! "Art is like grand music, an eternal act of generosity..."
THE VIDEO KING has a new exhibition at Metro Pictures. Artist, Tony Oursler has done it again. To our delight and facination, the show is fabulous. There will be a Book Signing at Marlborough Gallery on Thursday, March 19th. All are welcome to attend.